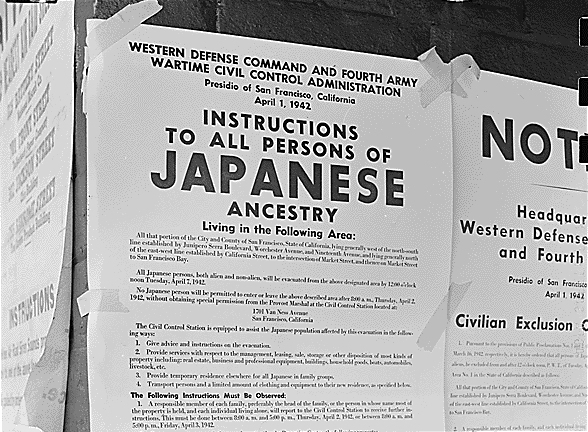 February 19th marks seventy-two years since President Franklin Roosevelt’s signing of Executive Order 9066. A response to Pearl Harbor, it authorized the army to designate military zones from which they could exclude any person deemed a threat. 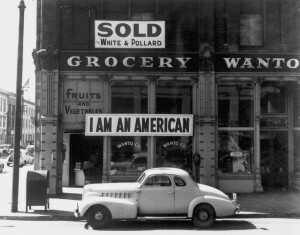 Beginning in March 1942, they did just that: about 120,000 Japanese Americans were rounded up and “evacuated,” first to temporary “assembly centers” (where families often found themselves living in hastily-converted parking lots or horse stables) and then to ten concentration camps isolated in the interior of the country. Permitted to take only what they could carry and restricted by discriminatory property laws, most were forced to abandon or sell — for pennies on the dollar — businesses in which they’d invested their life’s savings, homes they’d built, farms they’d painstakingly cultivated from once-inhospitable land. Most of us know a little bit of this story, but even today, when teachers, textbooks and Wikipedia agree that the wartime incarceration of Japanese Americans — two-thirds of them U.S. citizens, more than half of them children — was a mistake caused by “race prejudice, war hysteria, and a failure of political leadership,” many of the more unsettling pieces of this history remain little known. 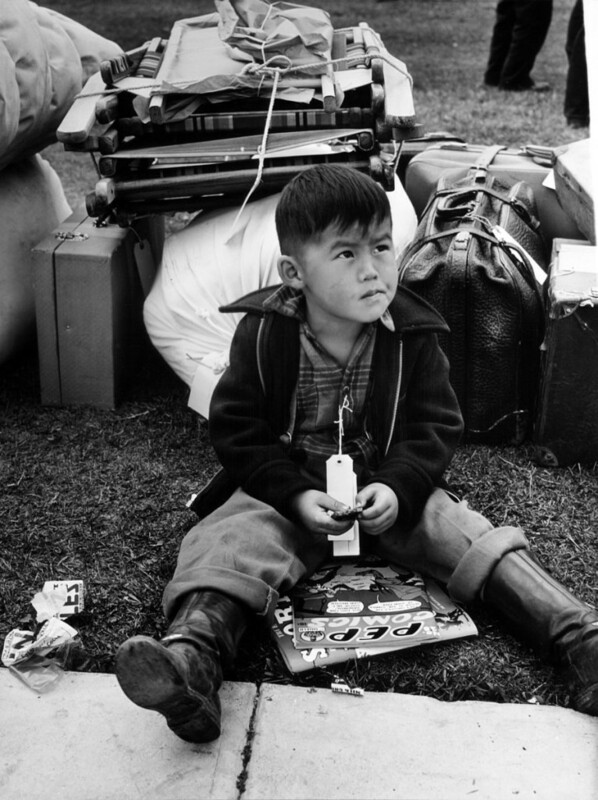 Take, for example, the quiet displacement of orphans of Japanese ancestry. Your high school WWII unit probably didn’t cover this. In June of 1942, sixty-one children were bused, under armed guard, from Los Angeles to the sunny-sounding Children’s Village within the Manzanar concentration camp. 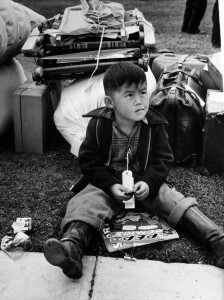 Most came from one of three California orphanages that housed children of Japanese ancestry, but this first group was soon joined by children from Washington, Oregon and Alaska. About one-third of these orphans were less than four years old; half were under age seven. Many of the 101 kids who would be confined in the Children’s Village over the next three years had been separated from non-Japanese foster families. Others had become orphans following the FBI’s mass arrests of community leaders. 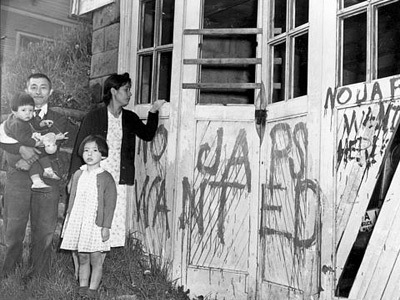 Still others didn’t know they had any Japanese heritage until their guardians turned them over to authorities or a “drop of Japanese blood” was discovered in orphanage records. 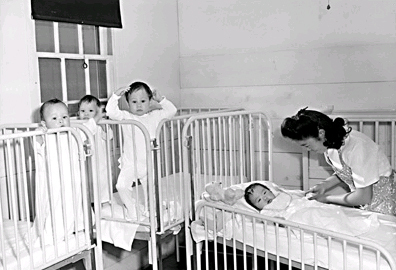 Infants born to unmarried mothers in other camps were sent to the Manzanar orphanage as well. Isolated before the war and ostracized by other Japanese Americans in camp, the kids of Children’s Village and their caretakers became a kind of family. Leaving this tight-knit community was for many orphans the most difficult part of their camp experience. 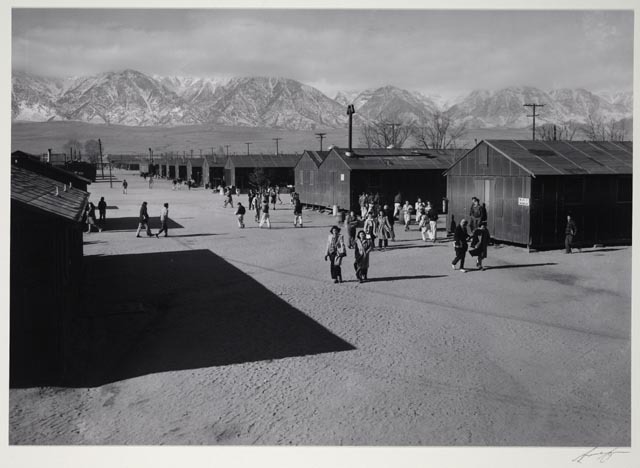 When word came that Manzanar would begin to shut down, children often found they had nowhere to go, no relative or guardian to claim them, either because the records had been lost during the process of removal or because a guardian wasn’t named prior to their detention. Camp authorities began a not entirely successful scramble to place children with adoptive parents or temporary guardians. Most of these unclaimed children ended up in institutional homes, waiting in a state of legal limbo, after the orphanage officially closed in September of 1945. Today, Manzanar still stands as a physical reminder of the incarceration. A plaque at its entrance reads, “May the injustices suffered here … never emerge again.” On the 36th Day of Remembrance we remind ourselves of the Children’s Village and the many other failures of justice that were allowed to take place across the country, that we might face current and future injustices with vigilance and compassion for all people, and that we might keep this ugly history from repeating itself. To learn more about Japanese American Incarceration (Japanese Internment Camps) please visit www.densho.org or visit the Densho Facebook Page.